Rains return after 7 days! Monsoon has advanced into the northern areas of the country mainly Azad Kashmir, Khyber Pakhtunkhwa and northern Punjab on June 27. Last rains (pre-monsoon) that occurred in the country was on June 16/June 17. After that rain (monsoon) again started falling from June 25. On June 26, 65 mm rain fell in Murree, Punjab while on June 27, 71 mm rain fell in Bannu, Khyber Pakhtunkhwa. The first spell of monsoon rains is mostly moderate and it has become significant only due to the western trough ’11’, the rains can continue till early first week of July. Across the border, North-western India had one of it’s worst flood in years with fresh heavy rain falling near the flood-hit areas. *Western trough ’11′ is over the north-western areas of the country. *Low pressure over south-east Utter Pradesh (India). *INDIAN OCEAN DIPOLE – Sea temperatures in the western Indian ocean near African coast are cool while the temperatures in the eastern Indian ocean near Indonesia are high. Slight trend towards negative Indian ocean dipole. *DUST CLOUD – Strong dust cloud presence over southern, moderate over central while weak over the northern areas. The Article would be updated when once the first spell is over! 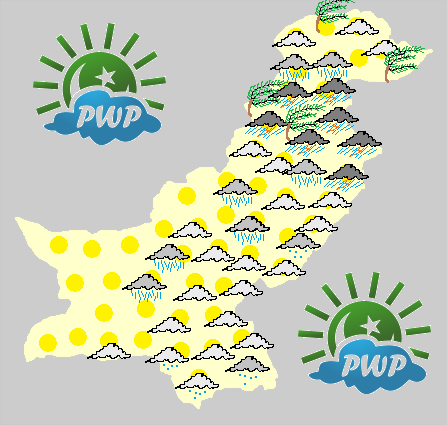 Pakistan Weather Portal (PWP) successfully predicted the onset of the pre-monsoon activity in the country as PWP’s pre-monsoon forecast was around June 14 (+2,-2 day error), PWP on June 4 told that scattered to widespread pre-monsoon can occur in the country and on June 8 PWP told that very heavy rainfall can occur in NE Punjab though SE Sindh did not get the ‘expected intensity’ rains. For the onset of Monsoon, PWP in it’s Monsoon V published on June 6 did say that monsoon onset can happen during the last week of June/first week of July while on June 23 (upgraded the chances of monsoon to ‘extremely high’ on June 26), PWP said that monsoon onset can occur in the northern areas on June 26 (+1, -1 day error), isolated rains started June 25 while monsoon advanced into these areas on June 27. *On June 22, a low pressure formed over Bay of Bengal and moved in a WNW direction towards Odisha coast on June 24, the next day it lied over North Chhattisgrah. On June 27, it was over south-east Utter Pradesh with some deepening. This low pressure had an encounter with the western trough ’11’ over the north-western areas of Pakistan on June 27 that will cause the low to persist till next two to three days over the some area, the moisture will cross into Nepal and China. The interaction with the western system can cause some thunderstorms to form north-eastern parts of Pakistan on June 28 night/June 29. There is another possibility (only GFS) of a circulation/low forming over the central parts of India that will merge with the monsoon axis over Himalayan ranges over the northern India during the first week of July. Rain with chances of isolated heavy falls can occur in capital from June 28 night till July 1 with intervals. Rain will be accompanied by thunder/lightning and strong winds (>56 km/h). 34°C to 38°C in Islamabad. Most rain has occurred in Khyber Pakhtunkhwa during the current spell. Rain with thunder/lightning along with strong winds (>56 km/h) can occur in Khyber Pakhtunkhwa. There are chances of isolated heavy falls in Khyber Agency, Landi Kotal, Orakzai Agency, Khurram Agency including Parachinar, Abbottabad, Haripur, Manshera. The provincial capital of Balochistan Quetta would remain dry with partly cloudy sky. There are chances of isolated rain in Khuzdar, Kalat, Awaram, Zhob, Musa Khel, Barkhan and few adjoining districts during this period. 32°C to 36°C Quetta, remains unchanged. In Northern Punjab: Lahore, Faisalabad, Murree, Gujranwala, Rawalpindi, Sargodha, Sialkot and other adjoining cities. Rain with chances of isolated heavy falls on June 28 night till July 1 with thunder/lightning and fast to strong winds (>56 km/h). There are chances of isolated heavy falls in Attock, Rawalpindi, Jehlum and few adjoining areas. 34 °C to 38°C in Lahore. 41°C to 45 °C in Faisalabad. 21°C to 26°C in Murree. In Southern Punjab: Bahawalpur, Bahawalnagar, Multan, Rahim Yar Khan, D. G. Khan and other adjoining cities are expected to remain dry with passing clouds. However showers with windy conditions can occur in Dera Ghazi Khan district on June 28/June 29 while isolated shower can occur in Bahawalnagar districts on June 29/June 30. Overall the temperatures are high in this part of Punjab. 40°C to 43°C in Multan. 41 °C to 44 °C in Bahawalpur. In Upper Sindh: Sukkur, Larkana, Jacobabad, Kashmore, Nawabshah and other adjoining cities. Mostly dry conditions are expected with increase in clouds during the night in NW parts of upper Sindh. Overall the temperatures are high in this part of Sindh. Following is the range of day temperatures expected in this part. 43°C to 45°C in Sukkur. 42°C to 46 °C in Larkana. 43°C to 47 °C in Nawabshah. In South-eastern Sindh: Mirpur khas, Umerkot, Tharparkar, Badin and Hyderabad. Mostly dry weather expected with increase in clouds during the night/morning while there are chances of showers with thunder/lightning in Tharparkar district. Following are the day temperatures, high temperatures are prevailing in this part of Sindh as well. 36°C to 43 °C in Hyderabad. In coastal Sindh: Karachi, Thatta, Keti, Shah Bandar and other coastal localities. Mostly dry weather expected with cloudy night/morning along with chances of drizzle. Temperatures have returned to their calm level in the coastal belt. 33 °C to 36°C in Karachi. The first spell will weaken significantly on July 1 though since the monsoon has advanced into the northern areas therefore the moist-laden winds will prevail with chances of drizzle/isolated showers in few areas of northern areas. The second spell can hit the northern areas during the late first week of July/second week of July. Proper monsoon rains in the central and southern areas of the country are not seen at moment. People are eager to know when will they get their share of rains! Monsoon mostly advances into Karachi during the mid-week of July. Monsoon rains returning to North! Monsoon onset happened on June 27 in the northern areas. PWP in it’s Monsoon V published on June 6 did say that monsoon onset can happen during the last week of June/first week of July while on June 23 (upgraded the chances of monsoon to ‘extremely high’ on June 26), PWP said that monsoon onset can occur in the northern areas on June 26 (+1, -1 day error), isolated rains started June 25 while monsoon advanced into these areas on June 27. *Low pressure over East Rajasthan and adjoining Madya Pradesh. *Fresh circulation can form in the Bay of Bengal on July 6/July 7. The monsoon spell started from June 25 with weak intensity and gained strength on June 27 and weakened significantly on June 30 though isolated rain continued till July 1. After July 1, temperatures started rising in the some parts of the country. The first monsoon spell was more focused in Khyber Pakhtunkhwa due to western trough ’11’ however top cloud temperature showed that monsoon moisture played a significant role in the rains. On June 28, PWP said that the second spell can occur in the northern areas during the late first week/early second week of July. On July 1, PWP upgraded the chance of second spell at ‘poor’, in the following days it was further upgraded. On July 2, PWP gave the date for the second monsoon spell that was July 7 (+1,-1 day error). On July 3, PWP upgraded the chance to ‘very high’ and the next day it was upgraded the chance to ‘extremely high’. Mostly dry weather expected till July 5 with chances of thundercloud formation near northern Punjab that can being drizzle/showers with thunder/lightning. Second Monsoon spell is expected from July 7 (+1,-1 day error), rain with thunder and lightning along with fast/strong winds can occur in many places of the northern areas. Rain at times heavy (isolated very heavy in few areas) can occur on July 8 till July 10 early in the Northern and North-eastern districts of Punjab (Lahore, Sialkot, Gujranwala, Faisalabad, Sheikhpura, Rawalpindi (including Murree city), Jhelum, Gujarat, Mandi Bahauddin and few adjoining areas). During the second spell, 45 mm till 110 mm is being showed in various areas of upper Punjab. Rain with thunder and lightning is also likely in Islamabad especially during July 8 and July 9. North-western areas of Punjab that is Attock, Sargodha and adjoining areas can also witness rain with thunder and lightning during this period. Rain with thunder/lightning also likely in Azad Kashmir including Muzaffarabad however there are chances of isolated heavy falls in Kotli, Mirpur and adjoining cities of the state. Rain with thunder and lightning can occur in Peshawar, Abbottabad, Manshera, Haripur, Swabi and adjoining districts with chances of isolated heavy falls in Hangu, Kohat, Khyber Agency, Khurram Agency and lower Peshawar district. The second spell starting from July 7 (+1,-1 day error) can end on July 10 evening/night. Mostly dry weather expected in this part (South Punjab and Northern Balochistan) of the country however there are chances of drizzle/isolated showers with thunder and lightning in Bahawalpur, Bahawalnagar, Rahim Yar districts of south Punjab due to the closeness of a thundercloud formation over West Rajasthan. Partly/Mostly cloudy weather can occur in Multan, DG Khan and adjoining areas. Partly/Mostly cloudy conditions with chances of drizzle in Barkhan, Musa Khel districts of Balochistan while dry with passing clouds in Quetta. Thunderstorms due to a circulation associated with low pressure over East Rajasthan and adjoining Madya Pradesh, these thunderclouds would be crossing south Gujarat and adjoining Sindh till next few days. Chances of isolated shower/light rain in Karachi, Tharparkar, Umerkot, Sanghar, Khairpur, Badin, Jamshoro, Thatta and adjoining areas. In Balochistan, there are chances of drizzle/isolated showers in Awaran, Khuzdar, Panjgur and adjoinig districts of Balochistan. Monsoon Advancing into Southern and Central areas? Monsoon moisture is continuously penetrating into Sindh while it is weak in South Punjab, monsoon can advance into Sindh and South Punjab during early mid-week of July as a fresh low pressure can bring rains to Sindh on July 13/July 14. PWP will monitor this situation again. ← Lenticular Clouds and the skies of Pakistan! Mostly dry weather expected in the city with passing clouds as no major rain is seen. 1>there are strong winds in sindh from some days when will they end? 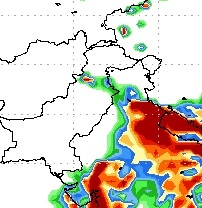 2>can we say no rain coming in sindh in july? 1. These strong winds are mostly due to the westerlies that has weakened the already weak easterlies over south-east Sindh. They would end once the WD ’11’ weakens and moves way. 2. No there are slight chances of rain in Sindh in July but not the major chances that we saw in 2011 and late 2012 monsoon. Monsoon does not start in June in Sindh, it mostly starts during the second or mid-week of July. We still have time. That dust cloud concentration over Sindh is too strong. I don’t think Sindh is seeing any Monsoon rains in July. Sad ! I am little optimistic about rains though not about drenching rain but some stable rain can occur. Monsoon does not start in June in Sindh, it mostly starts during the second or mid-week of July. We still have time. Dust cloud is showing no signs of weakening. in the begining there are chances of monsoon rain in sindh because of high temperature. But now the south western winds are so strong in karachi which resist a hot weather.Therefore not any chances of monsoon rain.south western winds which bring a cloud with him are not responsible for any rain in karachi due to the low altitude of karachi.It only causes a drizzling and fast wind.Rain is always come when hot wind mix up with the cold wind of sea.This typs of phenomenon is not occur in karachi. Dust Cloud phenomena is baseless. According to Jim Andrews (Accuweather.com Expert), there is no link between Monsoon and Dust Clouds. Here is the answer, he gave to my question via email. Kindly read it. Some of the information found in the reader article may not be accurate. It is known that airborne dust can suppress deep convection over tropical oceans, lowering the frequency of tropical cyclones. This has been observed for the Atlantic Ocean. Could this be true over land? Well, I guess so. However, dust over Pakistan may also imply lingering influence upon regional weather by the Westerlies, which by itself would likely yield low rainfall in and near Pakistan. The other argument (splitting of the Monsoon) strikes me as spurious. As you know, the rain giving monsoon is a SW current; the easterly flow that he depicts is high aloft. As for desertification and the drought feed-back cycle, I do not know if a massive tree-planting mission would have any meaningful bearing. Most of the land between Pakistan and west Africa has been desert for thousands of years. I hope this help you to better understand. Craig Dremann’s dust cloud theory has some weight though since its new therefore it needs a further research to establish a direct link with the monsoon season though monsoon’s behavior and frequency depends upon several other atmospheric factors (excluding the Dust cloud). The way he has compared the dust cloud with the thunderstorm movement is interesting. Thanks for your comments. I have posted a reply six spaces down, with a link to the June 29, 2013 Dust Cloud image, along with my predictions of more stalling of the monsoon in India which may continuing the floods, and the lack of rainfall continuing in Pakistan because the Dust Cloud is currently occupying the country. I am not saying that the Dust Cloud is splitting the monsoon, it is stalling and blocking the monsoon currently, causing the floods in India right now. Anyone can compare the daily Pakistan-Arabia Dust Cloud image and see that wherever the Dust Cloud is over a part of the country, usually there is no rainfall and heat and drought follows. And when the Dust Clouds moves or there is a break, then the rains follow. And when the Dust Cloud makes a barrier, then the monsoon stalls and o the east of the barrier, and can cause floods. The question to ask the experts, is atmospheric dust included in most climate models currently? When the atmospheric dust is factored in eventually, a whole new picture, especially of the summer Indian-Pakistan-Arabia monsoon moisture flows, droughts and floods, will be very clear to all the climatologists and meteorologists and the weather forecasters. What I am trying to suggest, is that monitoring the daily Dust Cloud may give the people of Pakistan and India a forecast warning of very near future floods, surface dust storms, heat waves and droughts. Since this Dust Cloud is man-made, then we have the opportunity to change and make it go away, but stop feeding it the planet’s soil. I am not suggesting tree-planting in any deserts, just leaving enough of the natural desert vegetation soil cover, to cover the soil to keep it from getting airborne. Like the native desert grasses, and desert wildflowers, etc. You have to start with the smallest things first, like the desert weeds. 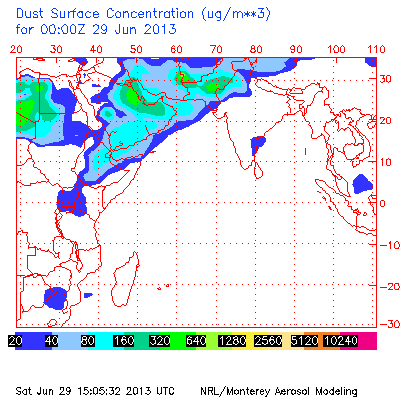 As per latest model the dust cloud will start to weaken after 5th july. No ‘high chance of good amount of rain in Multan’ seen. Wait for the first spell to end in the north. last night severe supercell thunderstorm hit Islamabad/Pindi…………was just AWESOME. extreme rain ( though for 15-20 min ) and damaging winds gave a horrible sight. Babar Bhai can u find out the wind speed in Isl/pindi last night plzzz??? Yes people from Islamabad/Pindi are telling that severe weather that occurred in the twin cities during the mid-night. Islamabad airport has reported 93 km/h winds. I know right!!! Microbursts produced by the supercell were so intense and damage could be seen on the eastern parts of Rawalpindi. Even my own house wind was blown away and a tree was down just by our house and those things have survived a 145 km/h wind gusts last June so I can only imagine how awesome this last one was. The wind speed in Islamabad wasn’t reported but Babar already told you the wind in Rawalpindi to have reached 93 km/h 🙂 I can assure you wind gusts during the peak of the storm exceeded hurrican force (120 km/h). Different areas can have different windspeed. Maybe your area had 120 km/h, 93 km/h was recorded from Islamabad Airport. Today the Pakistan-Arabia Dust Cloud has formed a solid wall against the monsoon, that you can see at http://www.ecoseeds.com/dust-6-29-13.png and unless it weakens or moves westward, Pakistan may experience dry weather with high humidity and strong winds plus surface dust storms. You can see on the Dust Storm image for today, where the dust is being generated in the central-southern part of Pakistan, and that will be area with the lowest rainfall–wherever the lack of vegetation can produce bare soil that can get airborne and feed the Dust Cloud. 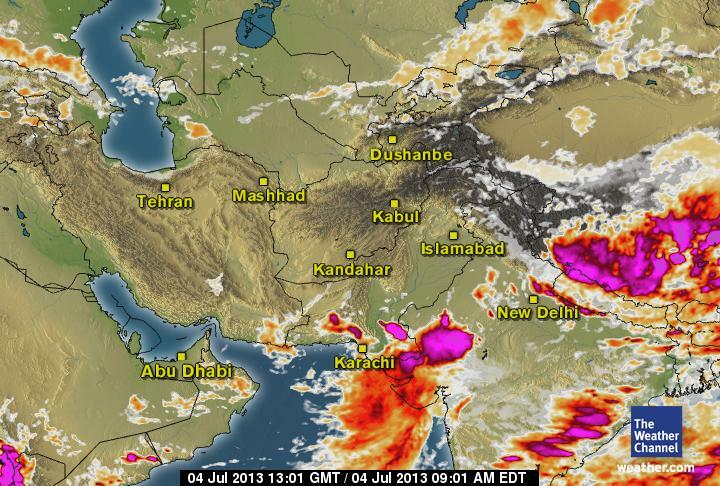 The Dust Cloud is stalling the monsoons over India at the same time, causing the terrible floods in India. When we do not leave any vegetation cover to keep the soil from getting airborne, are the feeders and creators of the Dust Cloud, and at the same time, we can stop feeding it, so that the normal monsoon flow is not blocked or stalled in the future. I just completed a painting of the battle between the Dust Cloud and the field of battle between these two powerful forces, when they engage in their annual summer fight over Pakistan and India that they have been doing for the last 5,000 years, in my painting number 48 at http://www.ecoseeds.com/art3.html. Yes I remember it.What will happen in isb and khaur. Should we be expecting more rain in Jalalia?? Yes the chances persist till tomorrow. Ok thanks. We had only two nights of rain for this spell.. 1 night of rain, next dry, then another night of rain, and today again dry, let’s see what happens tonight. Babar Bhai No rain ocuured in Risalpur during current spell. Why? Is there any chances of Rain in coming Days. Are you sure? Because in the surrounding areas it has rained though it was stable in intensity. WD ’11’ is now more focused towards Punjab and Azad Kashmir than KPK (as compared to last three days). A thundercloud can develop during the evening, watch for its movement. Lahore had a nice rain with very strong winds last night. Right now, its calm over there. Bro, is it end of first spell if monsoon? Yes, did see the scenes on TV it was epic. The spell persists till 48 hours though intensity would weaken from tonight. Go to http://www.nrlmry.navy.mil/aerosol/index_shortcuts.html and look on the left side under PRODUCT, then look for NAAPS Current, then go to the right to the green dot under Region–IndOcn. When the page comes up, the Dust Cloud is in the lower left hand corner. When will it rain in Karachi in July?Is there any good chance?And how does dust cloud effect rain in Karachi? In short, no chances of ‘rain’ in Karachi, dust clouds blocks/limits the movement of thunderclouds. This type of sharp drizzle are not common in karachi. A wind which come from the only southern direction result in sharp drizzle and lightening.You also observe the movement of cloud which only come from the southern direction which result this sharp drizzle.This is big weather change in karachi.A sharp drizzle is cause as a result of change in the direction of wind in the southern direction which normally come from the south western direction. This type of sharp drizzle are not common in karachi. A wind which suddently come from the northern direction result this sharp drizzle and lightening.You also observe the movement of cloud which come from the northern direction as a result of change in the direction of wind which this sharp drizzle.This is big weather change in karachi.A sharp drizzle is cause as a result of change in the direction of wind from the northen direction to southern direction which normally come from the south western direction. Thanks to Dear Craig Dremann and Tarim. It can start during the second week of July, it is also following a similar pattern like the first one. Babar Bhai I appreciate your Blog. This is the only accurately forecasting blog. One thing that in pre monsoon Risalpur received good rain On15th june night. But no Rain occured in The first Spell Of monsoon. Why? Is there chance of Rain in Risalpur during Second Spell of Monsoon? The thing that I observed in this first spell was that the thunderclouds were stronger over Khurram Agency and adjoining Agency as they were moving eastwards they weakened thats why no to little rain occurred in Nowshera district including Risalpur, even Peshawar city. There are chances of rain/showers during the second spell, this spell can be weaker than the first one at the moment. These thunderclouds are coming from India. i was also searching the same thing for the very first time…. and i got to know about the link in google naming karachimetrological.wordpress.com… or something like that…. Low pressure forming in the Bay around 13th july ? An Indian blog showing that the Monsoon could hit Karachi around 12 july. And they’re showing heavy rainfall in the Northern areas on 9th july. 1. By looking at the maps and charts, rain activity is being focused over NE Punjab and adjoining northern Punjab, 65 mm till 80 mm rain is being showed due to 2nd spell there at the moment. Similar story for Khurram and adjoining Agency of FATA. 2. While monsoon moisture has started reaching Sindh, tonight a bulk of thunderstorm was just NE and E of Sindh. Once the second monsoon spell starts in northern areas, Karachi can experience frequent drizzle/showers but proper onset could happen after July 12, mainly from July 13 or July 15. 3. Current low will move into south Gujarat due to which we can see similar thunderclouds that we saw today in E.Sindh and adjoining coastal Sindh. A fresh circulation in NW Bay can form on July 6 and move inland on July 7, Only GFS shows it intensifying. Last night south-estern part of Tharparkar District has recieved light shower. No chances of rain. Thunderclouds can form W of Rajasthan that can bring drizzle/isolated showers. Clouds are coming from india. What about the dust cloud Mr. KM ? Yes the dust cloud has weakened from the strong stage. Yes the Dust Clouds seems to be weakening after observing the clouds movements…. please share the latest dust cloud data babar bhai if you could. The Navy website’s link seems to be broken or the website is down, I would post it as soon as it comes back. Babar, you will need to contact the webmaster directly and explain why all of the internet traffic to view their NAAPS website has been coming from your country, and what the Dust Cloud images are needed for, and see if they can set up a direct link for the Indian Ocean dust cloud images. Unfortunately, there are no other sources of daily Dust Cloud images anywhere on the planet currently. Otherwise, those images will no linger be available for viewing. Let us all know what the new URL link will be, if you are able to get it established. There is a large Thundercloud forming over Upper Sindh. Large thunderstorm indeed, reports of showers/rain with thunder/lightning in Sanghar and Khairpur district. We would see a good start of Monsoon if the fresh low pressure comes to Sindh. Some problem within their site maybe. Babar, another option is to ask if the NAAPS webmaster email you the daily Dust Cloud image for the Indian Ocean, and you post it somewhere on your server? Okay I will email them. And it would be better if you contact them as well. Can this thundercloud over Sindh further weaken the dust cloud ? The dust cloud has weakened that is the reason thunderstorms rolled into Sindh according to the “dust cloud and monsoon theory”. It is raining lightly in Hyd from past half hour, is there chances of more rain till tomorrow morning or tomorrow night? Yes, chances persist till 24 hours. That cloud is a non precipitation cloud. As soon as it passes by, thunderclouds immediately follow it. Hi. We are getting white clouds (sorry for lack of technical term) today in our area of North Western Punjab which is Jalalia, Attock area. Do the white clouds carry rain? Are we getting rain tonight or tomorrow morning/ night?? Are the clouds high, low or mid? Tonight there are chances of showers in NE Punjab. From tomorrow evening/night there would be chances of isolated rain in NW punjab. heavy rains are expected in upper Sindh specially in sukkur in jully? Chances of light to moderate rains. Babar bhai kal humari city Mirpurkhas m achi khasi Rain hui jo k 22 mm record ki gai mgr Babar bhai ap ne aixi koi forcast nhi batai thi jix m Mirpurkhas ka zikar ho infect kafi web sites pr Mirpurkhas m rain ka nhi tha Siway PMD ki site k aixa kiyon hua?? ?our Mirpurkhas City m Heavy to V Heavy Rains kb hongi??? Yes well-aware of it. I mention those areas which had high probability of this activity though I mentioned that Tharparker and adjoining districts, Mirpur Khas district is just West of Tharparkar. Yes I hope they dont change. Conditions are favorable at the moment for monsoon onset during that period. is there are chances of rain in bahawalpur evening/tonight or tomorrow? Thunderclouds that form over Rajasthan are dissipating over W.Rajasthan. At the moment, few high level and mid level clouds are penetrating into eastern Bahawalpur district therefore slim chances of drizzle/isolated shower tonight. these clouds are coming from india into bahawalpur. There are chances of showers/rain during the second spell. I am thinking about the Ramadan article but since everyday a ‘Monsoon of Pakistan’ is updated and Pakistan Weather Update is issued/updated after one week so there is no need to post a detailed article but I will see. As the Dust cloud is fading, now are there chances of some Heavy showers in Hyd? weatherchannel is showing rains by 14th july. Bro, can youkindly issue forecast for Lahore and Islamabad for next few days? Mentioned in this article and ‘Monsoon of Pak’ page. I believe that after 2010, the activity in Bay of Bengal has decreased especially before monsoon (May and June), in post monsoon we saw depressions. On the other hand, activity in Arabian sea has increased (this year we saw two low pressure in the Arabian sea). There was a research few years back which stated that due to climate change the number of cyclones will decrease in Bay but those which will form will be very dangerous, it also stated that activity in Arabian sea will increase. And will you publish the Whole month forecast for Ramzan? I am thinking though there is no need for it as ‘Monsoon of Pakistan’ page already gives daily monsoon updates. Babar bhai 13/14 ko jo System Sindh m enter hoga us se kitni Shiddat ki rains hongi our Mirpurkhas City m koi Rain hogi is system se ya nhi? Mostly moderate, track of new low should be watched when it forms. Babar bhai Modrerate kitny mm se kitny mm tk ki rains ko kehty hein?i think 20mm se 50mm tk Moderrate Rain kehlati hai? Can you kindly share other GFS models with us ? Yes high level clouds continue to in a NE direction over the skies of Karachi. ran forecast for karach on 13 an 14 july? Yes there is a good possibility. Whole sky covered with Altocumulus and Cirrus clouds. Mostly moderate at the moment. Dont get disappointed, we still have a week. GFS will keep changing during that time. Has the low pressure formed or is it yet to form ? Bro, why is Sialkot one of wettest places of Pakistan? Any special reason for that? Northern and north-eastern cities of Pakistan are more wet as compared to the other parts of the country because of the Himalayas, while monsoon trough runs though northern Indian, Nepal till the north-eastern areas of Pakistan. Sir, 2013 ka monsoon, 2011 ki monsoon ‘dates’ ke mutabiq horaha hai. Upper parts of Pakistan mein, 1st spell 27 June 2011 ko hua tha. Aor iss bar bhi. 2nd spell 7th July 2011 ko hua tha, iss baar bhi. es ki kya wajah hai. There is no reason, nothing but a coincident! Bro, any chance of further rain over Lahore-Islamabad GT road sector within next 2 days? If yes, what will be its expected intensity? By July 7 night/July 8, the activity might be stronger in upper areas of Punjab than rest of the part. Sir, Monsoon ka Article (vi) kab upload karoge? These are SW clouds,these clouds aren’t capable of causing significant rain. It’s going to be sunny after an hour. GFS showing low pressure dissipating before entering Sindh, no site showing rains in Karachi now. It will keep changing though the chances of rain during mid-week of July still persist! AOA babar bahi I want to ask the ques from pwp why the cumulus cloud is not formed from south western wind of karachi.why stratus cloud is formed from sea wind which always causes a drizzle?sea breezes cause rain and thunderstorms according to McRoberts.But the effect varies with location.The incoming sea breeze is cooler than the air over land. This creates a small-scale cold front called a sea-breeze front. Like most cold fronts, sea breeze fronts can create showers and thunderstorms that pop up along the frontal boundary because it lifts the warm air ahead of it, which leads to convection. Sea breeze storms are common during the summer in places like Houston or New Orleans. why sea breeze storm are not common in karachi.Is the reason of no storm formation in karachi has low elevation of karachi? Those Cumulus clouds come along the SW breeze not Stratus clouds. Just take the example of Mumbai and Karachi, both the cities are almost similar. Mumbai has western ghats that act as barrier to the moisture winds, therefore local thunderstorm keep on forming here in the summer season. Karachi has no such mountain range near it, it is mostly surrounded by deserts. A sea-breeze front is a weather front created by a sea-breeze, also known as a convergence zone. The cold air from the sea meets the warmer air from the land and creates a boundary like a shallow cold front. When powerful this front creates cumulus clouds, and if the air is humid and unstable, cumulonimbus clouds, the front can sometimes trigger thunderstorms.why sea breeze front are not created in karachi? Mentioned in the previous comment. bro low pressure weaken before enter karach no chances of baresh or have? There are chances of rain in Karachi during the mid week of July. Not till many days in Karachi. AOA…Babar bhai bahawalpur me monsoon rain kab start hon gi…. Not till many days. Wait till mid week of July. Chances of drizzle/isolated shower persists due to moisture incursion. 25 mm recorded today. There are chances of drizzle.isolated shower as thunderclouds can form during the evening and dissipate while nearing south Punjab.